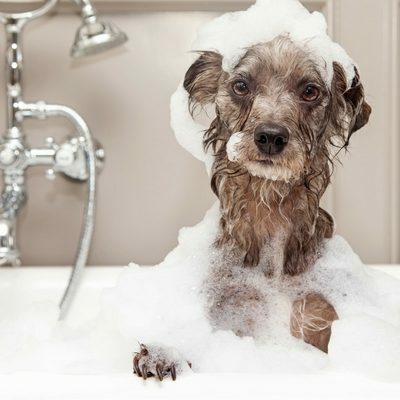 Grooming and bathing our dogs has huge benefits. It keeps their coats and skin clean and healthy … and, after all, a healthy pet is a happy pet! We provide a range of dog grooming services, from a basic bath and dry, up to a full luxury groom: bath and dry, clip and scissor, ears cleaned and nails clipped. We use our own shampoos and conditioners as well as other grooming aids and colognes. 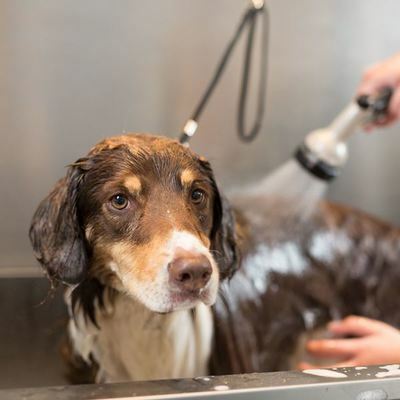 Your canine friend will be bathed in the appropriate shampoos and conditioners for skin and coat type but please do bring your own if these have been prescribed by your vet (e.g. Malasab etc). For our full grooming service, prices include: bath & blow dry, basic nail clip (including dew claws), removal of hair from ears, around the eyes, between the pads and around genital areas – to reduce irritation and matting. 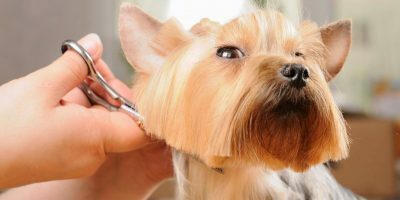 After this, they will be styled using clippers, scissors and/or hand stripping – or a combination of more than one depending on breed and coat type). 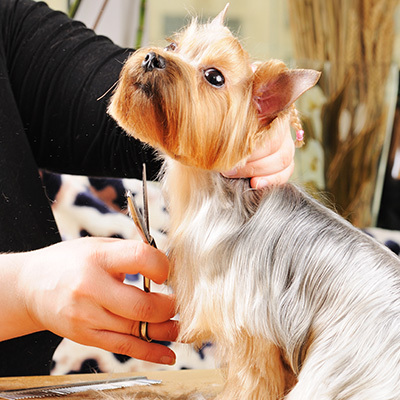 Styles can be show trim (breed standard), pet trim, clipped off or even your own style. Just describe the best you can or even bring a photo and we will try our best to imitate it. 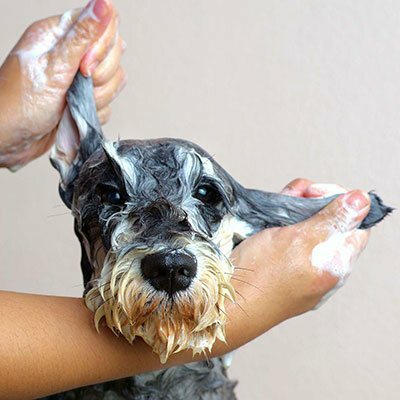 Grooming and bathing keeps pets healthy and we do understand that it is harder to keep long coated breeds in tip top shape. We, of course, recommend everyday brushing and combing and we do sell grooming aids and items in the salon to help. Just ask or give us a ring for free grooming advice! Just come along and drop off your canine friend and go shopping in the town centre – less than a 5 minute walk away. ALSO NOW AVAILABLE …. PEDICURE AND NAIL PAINTING FOR YOUR PETS …. To make a grooming rendezvous or reservation, please call 020 8948 2250 during office hours, Monday to Saturday. Appointments can be made on Sundays despite the boutique being closed. If you want a New Special Pedicure, please pre-book an appointment as the appointment times can take anywhere from 15 to 30 minutes. No appointments can be made by just turning up. However no appointment is required for normal nail clipping! ducts to suit the dogs skin/coat type. 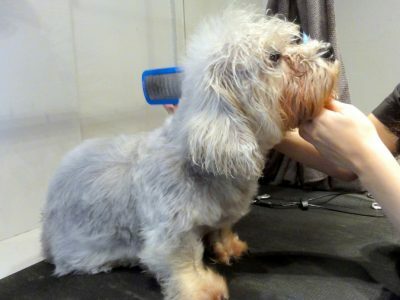 Our normal grooming prices do not include de-matting of severely matted dogs. If this is required, an extra £10 will be charged for every 15 minutes required. PLEASE NOTE that we groom humanely. Dogs that are too severely matted WILL be shaved off. We require at least 24 hours notice for cancellation of appointments. Missed appointments will incur a fee of £10, if cancelled on the same day as appointment, payable BEFORE another appointment can be made. If you simply just do not turn up for your appointment and do not let us know you are not coming, the full grooming fee will be charged and again must be paid prior to us making a new appointment for you. Dogs also arriving late may have to be re-booked. If you do not contact us prior to your appointment to confirm you may be late, and you are more than 15 minutes late, your appointment will need to be re-booked and the missed appointment fee will be payable. ALL dogs must be fully vaccinated. Unvaccinated dogs are put at risk and put others at risk. WE MAY ASK FOR PROOF OF VACCINATION.